In the following article, I will show you how to transfer and move music from computer to iPad with iTunes. Just like the other apple devices, if you want to copy music from your computer to iPad, you just need use to Apple free iTunes application. If you know how to transfer how to transfer music to iPhone and iPod, you certainly can sync music to ipad from PC easily. iTunes can easily copy PC songs to iPad. If you do not have iTunes in your computer, you should go to apple iTunes website to download and install it on your computer. Then run iTunes on your computer. Find the songs you want to sync to iPad. Click “Music” under LIBRARY list. Drag songs to the iTunes Music library from your computer. 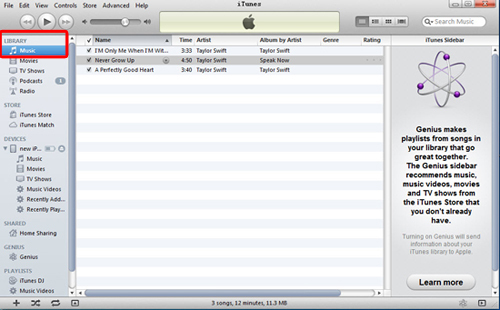 After adding music to iTunes music library , you can play them in iTunes. Or arrange their orders. Use your iPad data cable to connect iPad to computer. If connecting is successful, iTunes will recognize your iPad and show its name on iTunes under DEVICES. If iTunes can not recognize iPad, you should check if you have inserted the data cable to interfaces on both iPad and computer well. Or try to upgrade iTunes to latest version. Step4. Check “Manually manage music and videos” option. If you do not want music in iTunes library to replace your original music on iPad, you need to set this option. Select your iPad name under “DEVICES” and choose “Summary”, scroll down to the “Option” section. 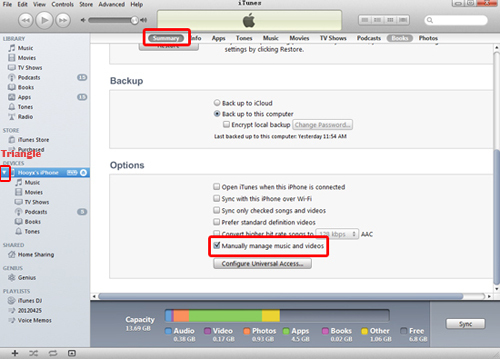 And check “Manually manage music and videos” option. In the dialog window, click “Apply”. Click the triangle before your iPad name to show up music , movies and other icons. Then switch to iTunes Library, open the music list in Music library. Drag music from music library to the music icon under your iPad device. Music has been moved to iPad music library successfully so far. If you want music in iTunes library to replace music in iPad, you can use Sync option and follow the instructions below instead of step4 and step5 above. Click your iPad name under DEVICES list. Choose “Music” from the list of available sync options. 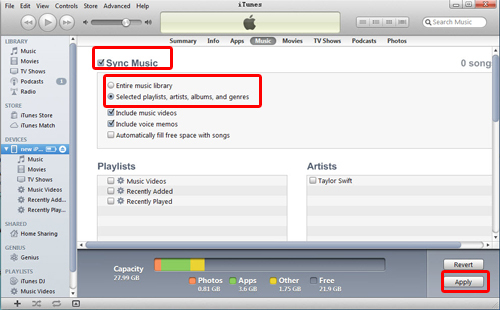 Check “Sync Music”, then you can choose to sync entire music library or selected playlists, artists, albums and genres. After selecting music, click “Apply” in the right bottom of the screen, then it will begin to sync iTunes music to iPad. Transfer photos among iPad, iPhone and iPod touch. Download iOS devices photos/videos to PC and Upload photos/videos from PC to iOS devices. 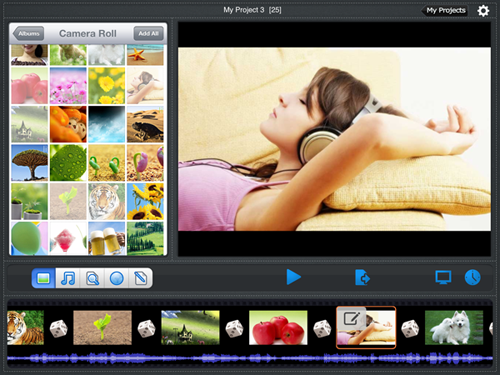 Slideshow DVD Creator can help you create professional-looking slideshows in minutes. And can export the slideshows to mov/ mp4, burn it to DVD or upload it to Facebook/ Youtube for sharing.